William Adams (1772-1851), Lawyer and diplomatist. Sitter in 3 portraits. Charles Brudenell-Bruce, 1st Marquess of Ailesbury (1773-1856), Peer and politician. Sitter in 1 portrait. William Charles Keppel, 4th Earl of Albemarle (1772-1849), Master of the Horse. Sitter in 4 portraits. William Arden, 2nd Baron Alvanley (1789-1849), Soldier. Sitter in 4 portraits. William Pitt Amherst, 1st Earl Amherst of Arracan (1773-1857), Statesman; Governor-General of India. Sitter in 5 portraits. Henry William Paget, 1st Marquess of Anglesey (1768-1854), Field Marshal and Lord-Lieutenant of Ireland. Sitter in 28 portraits. George Anson (1797-1857), General. Sitter in 3 portraits. Charles Arbuthnot (1767-1850), Diplomat. Sitter in 2 portraits. George William Campbell, 6th Duke of Argyll (1768-1839), Lord Steward of the Household and politician; MP for St Germans. Sitter associated with 6 portraits. George Ashburnham, 3rd Earl of Ashburnham (1760-1830). Sitter in 1 portrait. John Murray, 4th Duke of Atholl (1755-1830). Sitter in 3 portraits. George Eden, Earl of Auckland (1784-1849), Governor-General of India. Sitter in 8 portraits. Heneage Finch, 5th Earl of Aylesford (1786-1859). Sitter in 2 portraits. William Bagot, 2nd Baron Bagot (1773-1856), Agriculturalist. Sitter in 1 portrait. Thomas Barnes (1785-1841), Editor of The Times. Sitter in 4 portraits. Shute Barrington (1734-1826), Bishop of Durham. Sitter in 15 portraits. Thomas Thynne, 2nd Marquess of Bath (1765-1837), Politician; Conservative MP for Weobley; son of 1st Marquess of Bath. Sitter in 2 portraits. Henry Bathurst, 3rd Earl Bathurst (1762-1834), Statesman. Sitter in 10 portraits. Charles Powlett Townshend, 2nd Baron Bayning (1785-1823). Sitter in 2 portraits. Henry Somerset, 7th Duke of Beaufort (1792-1853), Sportsman. Sitter associated with 13 portraits. John Russell, 6th Duke of Bedford (1766-1839), Landowner; Lord-Lieutenant of Ireland. Sitter associated with 26 portraits. Charles John Gardiner, 1st Earl of Blessington (1782-1829), Man of fashion. Sitter in 3 portraits. Orlando Bridgeman, 1st Earl of Bradford (1762-1825). Sitter in 1 portrait. John William Egerton, 7th Earl of Bridgewater (1752-1823). Sitter in 2 portraits. John Cust, 1st Earl Brownlow (1779-1853). Sitter in 5 portraits. Richard Temple-Nugent-Brydges-Chandos-Grenville, 1st Duke of Buckingham and Chandos (1776-1839), Statesman and print collector. Sitter associated with 40 portraits. Thomas Burgess (1756-1837), Bishop of Salisbury. Sitter in 4 portraits. George Gough-Calthorpe, 3rd Baron Calthorpe (1787-1851). Sitter in 1 portrait. John Jeffreys Pratt, 1st Marquess Camden (1759-1840), Politician; MP for Bath and Lord President of the Council. Sitter associated with 10 portraits. Henry George Herbert, 2nd Earl of Carnarvon (1772-1833), Major, peer and Whig politician; MP for Cricklade. Sitter associated with 10 portraits. Caroline Amelia Elizabeth of Brunswick (1768-1821), Queen of George IV. Sitter in 98 portraits. Robert Smith, 1st Baron Carrington (1752-1838), Banker and politician; MP for Nottingham. Sitter in 1 portrait. Robert John Carington (né Smith), 2nd Baron Carrington (1796-1868), Politician; MP for Wendover, Buckinghamshire and Wycombe; son of 1st Baron Carrington. Sitter in 4 portraits. Richard Meade, 3rd Earl of Clanwilliam (1795-1879), Diplomat. Sitter in 1 portrait. John Fitzgibbon, 2nd Earl of Clare (1792-1851), Governor of Bombay. Sitter in 2 portraits. Henry Welbore Agar-Ellis, 2nd Viscount Clifden (1761-1836). Sitter associated with 2 portraits. Robert St John Trefusis, 18th Baron Clinton (1787-1832). Sitter in 1 portrait. Sir Charles Cockerell, 1st Bt (1755-1837), Banker. Sitter in 4 portraits. John Colville, 10th Baron Colville (1768-1849). Sitter in 2 portraits. Folliott Herbert Walker Cornewall (1754-1831), Bishop of Worcester. Sitter in 3 portraits. Charles Cornwallis, 2nd Marquess Cornwallis (1774-1823), Sportsman. Sitter in 1 portrait. George William Coventry, 7th Earl of Coventry (1758-1831). Sitter in 1 portrait. George William Coventry, 8th Earl of Coventry (1784-1843), Conservative politician; MP for Worcester. Sitter associated with 4 portraits. Peter Nassau Cowper, 5th Earl Cowper (1778-1837), Fellow of the Royal Society. Sitter in 1 portrait. Henry Cowper (1758-1840), Lawyer. Sitter in 4 portraits. Benjamin Currey, Clerk. Sitter in 1 portrait. Thomas Brand, 20th Baron Dacre (1774-1851). Sitter in 1 portrait. Sir Robert Dallas (1756-1824), Judge. Sitter in 3 portraits. John Bligh, 4th Earl of Darnley (1767-1831). Sitter in 5 portraits. William Legge, 4th Earl of Dartmouth (1784-1853), British peer and politician; MP for Milborne Port. Sitter in 2 portraits. Edward Southwell, 21st Baron de Clifford (1767-1832), Politician. Sitter in 3 portraits. Thomas Philip de Grey, 2nd Earl de Grey (1781-1859), Statesman. Sitter in 9 portraits. George John Sackville-West, 5th Earl De La Warr (1791-1869), Politician, Lord Chamberlain. Sitter associated with 4 portraits. William Ponsonby, 1st Baron de Mauley (1787-1855), Politician; MP for Dorset. Sitter in 2 portraits. William Basil Percy Feilding, 7th Earl of Denbigh (1796-1865), Peer and royal courtier. Sitter in 3 portraits. Thomas Denman, 1st Baron Denman (1779-1854), Lord Chief Justice. Sitter associated with 19 portraits. William George Spencer Cavendish, 6th Duke of Devonshire (1790-1858), Lord Chamberlain. Sitter in 12 portraits. Edward Digby, 2nd Earl Digby (1773-1856). Sitter in 1 portrait. Richard Hely-Hutchinson, 1st Earl of Donoughmore (1756-1825), Advocate of Catholic emancipation. Sitter in 2 portraits. Arthur Trumbull Hill, 3rd Marquess of Downshire (1788-1845), Irish peer. Sitter in 4 portraits. Thomas Reynolds Moreton, 1st Earl of Ducie (1776-1840). Sitter in 2 portraits. John George Lambton, 1st Earl of Durham (1792-1840), Governor-General of Canada. Sitter in 60 portraits. Kenneth Alexander Howard, 1st Earl of Effingham (1767-1845), Major-General. Sitter in 1 portrait. George O'Brien Wyndham, 3rd Earl of Egremont (1751-1837), Patron of art. Sitter in 9 portraits. Edward Law, 1st Earl of Ellenborough (1790-1871), Politician, President of the Board of Control and Governor-General of India. Sitter associated with 39 portraits. John Willoughby Cole, 2nd Earl of Enniskillen (1768-1840), Representative peer. Sitter in 2 portraits. Thomas Erskine, 1st Baron Erskine (1750-1823), Lord Chancellor. Sitter associated with 69 portraits. George Capell-Coningsby, 5th Earl of Essex (1757-1839), Lord-Lieutenant of Hereford. Sitter in 7 portraits. Brownlow Cecil, 2nd Marquess of Exeter (1795-1867), Lord-Lieutenant of Northampton and Rutland. Sitter in 5 portraits. Edward Pellew, 1st Viscount Exmouth (1757-1833), Admiral. Sitter in 6 portraits. Edward Boscawen, 1st Earl of Falmouth (1787-1841), Recorder of Truro. Sitter associated with 4 portraits. Charles Long, 1st Baron Farnborough (1760-1838), Paymaster General, art connoisseur, Chief Secretary for Ireland and politician; MP for Rye, Midhurst, Wendover and Haslemere. Sitter in 10 portraits. Lord John Edward Fitzroy (1785-1856), Politician; MP for Thetford and Bury St Edmunds. Sitter in 1 portrait. Hugh Fortescue, 1st Earl Fortescue (1753-1841). Sitter in 1 portrait. George Lane Fox (circa 1790-1848), Conservative politician; MP for Beverley. Sitter in 1 portrait. Frederick, Duke of York and Albany (1763-1827), Commander-in-Chief of the Army; son of George III. Sitter associated with 71 portraits. George Stewart, 8th Earl of Galloway (1768-1834). Sitter in 1 portrait. Sir William Garrow (1760-1840), Lawyer. Sitter associated with 4 portraits. Robert Gifford, 1st Baron Gifford (1779-1826), Judge. Sitter in 9 portraits. William Frederick, 2nd Duke of Gloucester (1776-1834), Field Marshal. Sitter associated with 28 portraits. George Gordon, 5th Duke of Gordon (1770-1836), Raised the Gordon Highlanders. Sitter in 3 portraits. Archibald Acheson, 2nd Earl of Gosford (1776-1849). Sitter in 1 portrait. George Henry FitzRoy, 4th Duke of Grafton (1760-1844), Whig Politician and Lord Lieutenant of Suffolk. Sitter in 3 portraits. Granville Leveson-Gower, 1st Earl Granville (1773-1846), Diplomat. Sitter in 4 portraits. William Wyndham Grenville, 1st Baron Grenville (1759-1834), Prime Minister. Sitter associated with 70 portraits. William Brodie Gurney (1777-1855), Shorthand writer and philanthropist. Sitter in 1 portrait. Peter Robert Drummond-Burrell (né Burrell), 2nd Baron Gwydyr, 22nd Baron Willoughby de Eresby (1782-1865), Politician; MP for Boston. Sitter associated with 6 portraits. Alexander Hamilton, 10th Duke of Hamilton (1767-1852), Diplomat. Sitter in 5 portraits. Lady Anne Hamilton (1766-1846), Lady-in-waiting to Queen Caroline. Sitter associated with 8 portraits. Thomas Hampden, 2nd Viscount Hampden (1746-1824). Sitter in 3 portraits. William Harcourt, 3rd Earl Harcourt (1743-1830), Field Marshal. Sitter in 9 portraits. Edward Venables Vernon Harcourt (1757-1847), Archbishop of York. Sitter associated with 11 portraits. George Granville Venables (né Vernon) Harcourt (1785-1861), Politician; MP for Lichfield and Oxfordshire; husband of Lady Elizabeth Harcourt. Sitter in 4 portraits. Henry Lascelles, 2nd Earl of Harewood (1767-1841), Conservative politician; MP for Yorkshire, Westbury, Pontefract and Northallerton. Sitter in 5 portraits. Dudley Ryder, 1st Earl of Harrowby (1762-1847), Statesman. Sitter associated with 15 portraits. Charles Hayter (1761-1835), Miniature painter. Sitter in 2 portraits, Artist associated with 5 portraits. Sir George Hayter (1792-1871), Portrait and history painter; son of Charles Hayter. Sitter associated with 16 portraits, Artist associated with 198 portraits. Henry Devereux, 14th Viscount Hereford (1777-1843). Sitter in 1 portrait. Rowland Hill, 1st Viscount Hill (1772-1842), General. Sitter in 25 portraits. William Howley (1766-1848), Archbishop of Canterbury. Sitter associated with 24 portraits. George Gordon, 9th Marquess of Huntly (1761-1853), Lieutenant-Colonel. Sitter in 1 portrait. George Child-Villiers, 5th Earl of Jersey (1773-1859), Master of the Horse to Queen Victoria. Sitter in 7 portraits. George Kenyon, 2nd Baron Kenyon (1776-1855). Sitter in 5 portraits. Peter King, 7th Baron King of Ockham (1775-1833), Authority on currency. Sitter in 7 portraits. Douglas James William Kinnaird (1788-1830), Writer and friend of Byron. Sitter in 2 portraits. James Maitland, 8th Earl of Lauderdale (1759-1839), Scottish politician and author of 'Inquiry into the Nature and Origin of Public Wealth'. Sitter associated with 37 portraits. George Henry Law (1761-1845), Bishop of Bath and Wells. Sitter in 6 portraits. Augustus Frederick Fitzgerald, 3rd Duke of Leinster (1791-1874), Representative peer. Sitter in 2 portraits. Edmund Henry Pery, 1st Earl of Limerick (1758-1844), Irish peer and politician. Sitter in 1 portrait. Robert Banks Jenkinson, 2nd Earl of Liverpool (1770-1828), Prime Minister. Sitter associated with 50 portraits. Robert Stewart, 2nd Marquess of Londonderry (Lord Castlereagh) (1769-1822), Statesman. Sitter associated with 46 portraits. William Kerr, 6th Marquess of Lothian (1763-1824). Sitter in 3 portraits. Stephen Lushington (1782-1873), Judge. Sitter in 19 portraits. John Luxmoore (1756-1830), Bishop of St Asaph. Sitter in 1 portrait. William Gordon Macgregor (died 1840), Lieutenant-Colonel. Sitter in 1 portrait. Henry William Majendie (1754-1830), Bishop of Bangor. Sitter in 3 portraits. Theodore Majocchi (active 1820), Witness at the trial of Queen Caroline. Sitter associated with 7 portraits. Charles Manners-Sutton (1755-1828), Archbishop of Canterbury. Sitter in 9 portraits. David William Murray, 3rd Earl of Mansfield (1777-1840). Sitter in 4 portraits. Charles Herbert Pierrepont, 2nd Earl Manvers (1778-1860), Naval Lieutenant, and later MP for Nottinghamshire. Sitter in 3 portraits. William Lamb, 2nd Viscount Melbourne (1779-1848), Prime Minister. Sitter associated with 159 portraits. Robert Dundas, 2nd Viscount Melville (1771-1851), Statesman. Sitter associated with 6 portraits. John Parker, 1st Earl of Morley (1772-1840), Peer and politician. Sitter in 8 portraits. William Mudford (1782-1848), Editor of the 'Courier'. Sitter in 1 portrait. William Nelson, 1st Earl Nelson (1757-1835), Brother of Lord Nelson. Sitter in 2 portraits. Hugh Percy, 3rd Duke of Northumberland (1785-1847), Lord-Lieutenant of Ireland. Sitter in 12 portraits. John Rushout, 2nd Baron Northwick (1770-1859), Art collector and connoisseur. Sitter in 3 portraits. Chaloner Blake Ogle (circa 1765-1857). Sitter in 1 portrait. George Fermor, 3rd Earl of Pomfret (1768-1830). Sitter in 5 portraits. William Henry Cavendish-Scott-Bentinck, 4th Duke of Portland (1768-1854), Lord Lieutenant of Middlesex and Conservative politician; MP for Petersfield and Buckinghamshire. Sitter associated with 4 portraits. John Allan Powell (circa 1781-1859), Solicitor and law agent for Lord Blessington. Sitter in 2 portraits. Charles Gordon-Lennox, 5th Duke of Richmond and Lennox (1791-1860), Soldier and Conservative politician; MP for Chichester. Sitter in 29 portraits. George Pitt, 2nd Baron Rivers (1751-1828). Sitter in 2 portraits. Sir Christopher Robinson (1766-1833), Lawyer. Sitter in 2 portraits. John Rolle, Baron Rolle (1751-1842), Politician; MP for Devon. Sitter associated with 6 portraits. Archibald Primrose, 4th Earl of Rosebery (1783-1868), Fellow of the Royal Society and politician; MP for Helston and Cashel. Sitter in 2 portraits. James St Clair-Erskine, 2nd Earl of Rosslyn (1762-1837), General. Sitter in 13 portraits. Lord George William Russell (1790-1846), Major-General. Sitter in 2 portraits. John Henry Manners, 5th Duke of Rutland (1778-1857). Sitter in 7 portraits. William Beauclerk, 8th Duke of St Albans (1766-1825). Sitter in 1 portrait. John Eliot, 1st Earl of St Germans (1761-1823). Sitter in 1 portrait. Alleyne Fitzherbert, Baron St Helens (1753-1839), Diplomat. Sitter in 6 portraits. Cropley Ashley-Cooper, 6th Earl of Shaftesbury (1768-1851), Chairman of committees in the House of Lords. Sitter in 6 portraits. Henry Addington, 1st Viscount Sidmouth (1757-1844), Prime Minister. Sitter associated with 71 portraits. Edward Adolphus Seymour, 11th Duke of Somerset (1775-1855), Mathematician. Sitter in 2 portraits. Bowyer Edward Sparke (circa 1760-1836), Bishop of Ely. Sitter in 2 portraits. Marchese di Spineto (circa 1774-1849), Interpreter. Sitter in 4 portraits. William Scott, Baron Stowell (1745-1836), Judge. Sitter in 5 portraits. George Granville Leveson-Gower, 1st Duke of Sutherland (1758-1833), Diplomat and magnate. Sitter in 22 portraits. George Granville Sutherland-Leveson-Gower, 2nd Duke of Sutherland (1786-1861), President of the British Institution. Sitter associated with 12 portraits. John Thomas Townshend, 2nd Viscount Sydney (1764-1831), Ranger of Hyde Park and St James's Park. Sitter in 1 portrait. Sackville Tufton, 9th Earl of Thanet (1769-1825), Gambler. Sitter in 1 portrait. Matthew Evan Thomas (1788-1830), Architect. Sitter in 1 portrait. George Tierney (1761-1830), Politician; MP for Southwark and Knaresborough. Sitter associated with 50 portraits. Sir Nicholas Conyngham Tindal (1776-1846), Chief Justice of Common Pleas. Sitter in 4 portraits. Power Le Poer Trench (1770-1839), Archbishop of Tuam. Sitter in 1 portrait. Thomas Wilde, 1st Baron Truro (1782-1855), Lord Chancellor. Sitter in 5 portraits. Sir Thomas Tyrwhitt (circa 1762-1839), Gentleman Usher of the Black Rod. Sitter in 1 portrait. William Van Mildert (1765-1836), Bishop of Durham. Sitter in 5 portraits. James Walter Grimston, 1st Earl of Verulam (1775-1845), Politician; MP for St Albans. Sitter in 3 portraits. William Vizard (1774-1859), Solicitor to Queen Caroline. Sitter in 1 portrait. Henry Richard Greville, 3rd Earl of Warwick (1779-1853). Sitter associated with 2 portraits. James Parke, 1st Baron Wensleydale (1782-1868), Judge. Sitter associated with 7 portraits. Robert Grosvenor, 1st Marquess of Westminster (1767-1845), Patron of art and the turf. Sitter associated with 8 portraits. Samuel Charles Whitbread (1796-1879), Politician; MP for Middlesex. Sitter in 2 portraits. Charles Whitworth, 1st Earl Whitworth (1752-1825), Diplomat. Sitter associated with 4 portraits. Sir John Williams (1777-1846), Judge. Sitter in 1 portrait. Charles Ingoldsby Burroughs-Paulet, 13th Marquess of Winchester (1765-1843), Politician; MP and courtier. Sitter in 1 portrait. Sir Matthew Wood, 1st Bt (1768-1843), Lord Mayor of London. Sitter associated with 39 portraits. W. Wright, Doorkeeper. Sitter in 1 portrait. Charles Mayne Young (1777-1856), Actor and comedian. Sitter associated with 23 portraits. The 'trial' of Queen Caroline in 1820 was not technically a trial but a parliamentary debate on a bill designed to grant the King a divorce. After separating from George IV, Caroline lived in England until 1814, and then travelled in Europe and the East. Her adulterous relationship with her Italian valet Count Pergami caused a scandal. On George IV's accession in January 1820 Caroline made haste for England to claim her throne as Queen. She was greeted by cheering crowds who, fuelled by their hatred of the King, dubbed her the 'people's queen'. 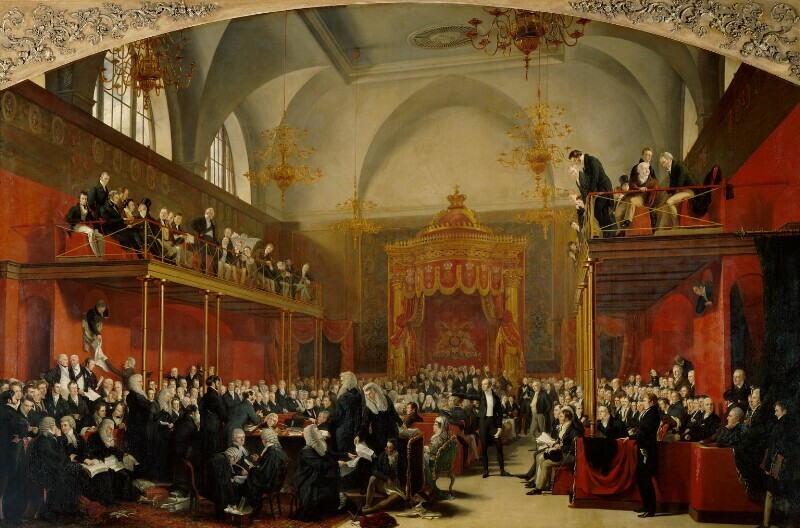 Hayter's painting shows the House of Lords on the sixth day of the trial, with Lord Grey questioning the Italian Majocchi who repeatedly denied any memory of Caroline's sexual indiscretions. Other prominent figures are Caroline herself, Henry Brougham her lawyer and the Duke of Wellington, standing under the left hand balcony. The proceedings ended in a compromise and the anticlimax of Caroline's acquittal, but not before it had provided a feverishly partisan England with one of the last great spectacles of the Regency.